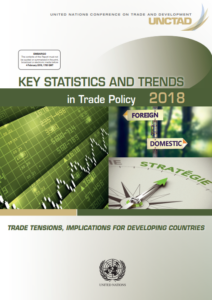 UNCTAD launched the 'Key Statistics and Trends in Trade Policy 2018' study highlighting that European Union exports are those to possibly rise, capturing about $70 billion of U.S.-China bilateral trade, meaning $50 billion of Chinese exports to the US, and $20 billion of U.S. exports to China. Also, Japan, Mexico and Canada will each capture more than $20 billion. Although the above do not represent a large part of global trade, as in 2017 it was worth about $17 trillion, for many countries they make up a substantial share of exports. For instance, the $27 billion of U.S.-China trade that would be captured by Mexico represents a non-negligible share of Mexico’s total exports. Also, substantial effects relative to the size of their exports are also expected for Australia, Brazil, India, Philippines, Pakistan and Vietnam. In addition, from the $250 billion in Chinese exports to US tariffs, approximately 12% will be retained by Chinese firms, whereas 6% will be captured by US firms. In the meantime, of the about $110 billion in US exports to China's tariffs, the 85% will be captured by firms in other countries, US companies will keep less than 10% and Chinese one will gain 5%. These changes are due to bilateral tariffs that cause an international competitiveness in favour of companies operating in countries that are not directly affected by them. Moreover, according to the study, the countries that are to benefit from the US-China tariffs are those that are competitive and have the economic capacity to replace the US and Chinese firms. Yet, the study shows that although many are the countries that will benefit from the tariffs, some of them will not have positive results. Soybean Market: Chinese tariffs on U.S. soybeans have resulted in distortions to the advantage of several exporting countries, in particular Brazil, which suddenly became the main supplier of soybeans to China. Concluding, the study supports that the negative effects are more likely to dominate. The trade disputes will have on the still fragile global economy. More countries may join the fray and that protectionist policies could escalate to a global level. As protectionist policies generally hurt weaker countries the most, a well-functioning multilateral trading system able to defuse protectionist impulses and maintain market access for poorer countries is crucial, states the report. 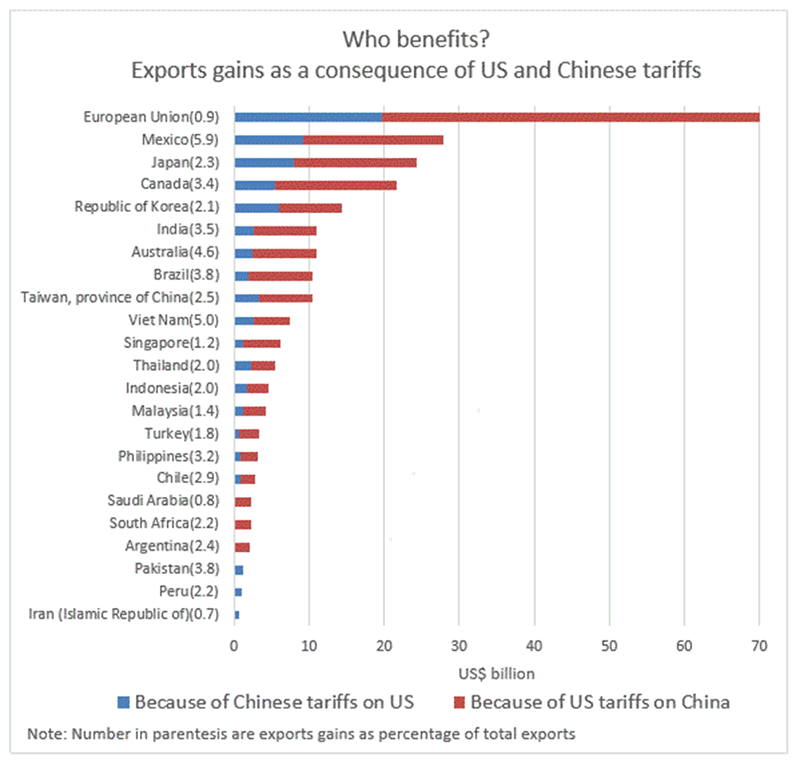 An interconnected global economy is most likely to have a domino effect beyond the countries and sectors targeted, as tariff rise penalize the assembler of a product, and also suppliers along the chain.